. 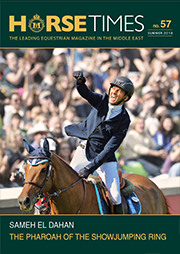 :: DUBAI WORLD CUP NEWS OF THE DAY ::. Audible—The son of Into Mischief continued to make a strong impression in advance of the $12 million Dubai World Cup sponsored by Emirates Airline (G1), coming to the Meydan dirt track right at 7:00 a.m. and galloping twice around under Amelia Green. Audible was given an extended freshening after running third in last year’s Kentucky Derby (G1) and returned with a victory in the Cherokee Run Stakes at , Capezzano, Gronkowski—All three of the Salem Bin Ghadayer-prepared charges trained at the handler’s Al Aryam Stables facility Wednesday morning. Churchill Downs last November. In his most recent effort, a fifth-place finish in the Pegasus World Cup Invitational Stakes (G1) on January 26, he was never able to get himself down to the inside portion of the track which was playing more favourably. Capezzano was a nine-and-a-half length winner of the Group 1 Al Maktoum Challenge R3 on Super Saturday, beating defending Dubai World Cup champion, Thunder Snow into second, and Bin Ghadayer believes that his five-year-old Bernadini charge is yet to show his best. Also lining up on Saturday will be Phoenix Thoroughbreds Ltd’s American imports, Gronkowski and Axelrod. Gronkowski - who is part-owned by New England Patriots wide-receiver Rob Gronkowski, for whom the colt is named - was second in the Grade 1 2018 Belmont Stakes while two-time Grade 3 winner, Axelrod was ninth in the Breeder’s Cup Classic. Bin Ghadayer believes the Dubai World Cup will be an open contest. Dolkong—Not before stopping to pose for the cameras for a considerable length of time, South Korean trailblazer Dolkongconsented to canter on the dirt track on Wednesday morning under regular work rider Lizzie Stubbington. Connections continue to be upbeat about the 5-year-old’s chances of returning home with some prize-money. “We’re really happy with how he is. He’s relaxed, but he’s in top shape,” trainer Simon Foster said. Gunnevera—It continues to be a very relaxed preparation for Antonio Sano’s contender, who completed his serious work back at home. He had another leg stretch around the dirt track this morning and Sano’s son and assistant Alex said: “He went half a lap jogging the opposite way and then did a lap and a half again - the first lap he did in a slow gallop then finished the final half in an open gallop style. K T Brave—K T Brave was out first thing on the dirt track this morning and clocked his final breeze in preparation for the race, going 1000m in 59.6, finishing up with an 11.3 final 200m under exercise rider Yosuke Fusano. New Trails—Trainer Ahmad bin Harmash’s first venture into the heady heights of the Dubai World Cup sponsored by Emirates Airline (G1) with the formerly French trained New Trails continued its calm preparation on Wednesday. “Everything is just ticking over,” said Bin Harmash, who gave New Trails and the rest of his five-strong team the last of their serious work at the weekend. North America—The 7-year-old remains in good form at trainer Satish Seemar’s Zabeel Stables as the countdown to Saturday continues. “He worked on Monday over 800m and we’ve just been hacking around with him,” Seemar said. Pavel—The Doug O’Neill trained Dubai World Cup contender Pavel came onto the dirt track at 5:00 a.m, where he first walked behind the stalls and then went for a jog. Seeking the Soul—Charles Fipke’s Seeking the Soul came out for an easy gallop under regular rider Pedro Velez and maintained the same routine he has had since arriving March 20. Later on Wednesday, post positions were to be drawn for the Dubai World Cup, but that was not a concern for Stewart. Thunder Snow—Already the only horse to have won both the UAE Derby and Dubai World Cup, Godolphin’s Thunder Snow will bid to become the first dual winner of the latter again on Saturday. Trained by Saeed bin Suroor, who is seeking to add to his record eight Dubai World Cup victories, the 5-year-old entire son of Helmet has been a star for his connections and, as well as his UAE feats, is also a dual Group 1 winner on turf in Europe. Thunder Snow was third in the Breeders’ Cup Class (G1) and was then given a deserved break until Super Saturday three weeks ago, when second, but after Bin Suroor had forewarned everyone his stable star would need the outing. “The plan after the Breeders’ Cup was always to freshen him up after a busy year and wait for Super Saturday,” Bin Suroor said. “We were very pleased with that comeback run because he very much needed it and has certainly improved a lot for it. He did his final serious piece of work on Saturday and we were delighted with him so we are looking forward very much to Saturday. Yoshida—Yoshida, who enjoyed a short maintenance breeze on Tuesday morning at Meydan, walked the shed row on Wednesday. Trained by Bill Mott for owners China Horse Club International Ltd., WinStar Farm, Starlight Racing, and Head of Plains Partners, the 5-year-old son of Heart’s Cry is being prepared locally for the Dubai World Cup by Mott’s son, Riley. The versatile Yoshida rose to prominence last summer by capturing two Grade 1 events, the Turf Classic at Churchill Downs and the Woodward on the Saratoga dirt, in a three-month span. Yoshida will be piloted by Dubai debutant Jose Ortiz. Almond Eye – The Japanese hope went for her much-anticipated breeze this morning under her regular jockey Christophe Lemaire. She travelled the 1000m over the Meydan turf course slowly gathering speed and finished the 200m in 11.8. Deirdre – Deirdre made her final gallop in preparation for the Dubai Turf this morning going 1000m under exercise rider Yuta Komiyama. The overall time was only 70.1 but she accelerated well to finish sharp clocking the 200m in 11.1. “She moved nicely and worked with good enthusiasm this morning. She has stayed in good shape and still looked happy after the gallop,” Komiyama said. Dream Castle (GB) – Already a Meydan Group 1 winner, having landed Super Saturday’s Group 1 Jebel Hatta, Godolphin’s Dream Castle looks to have leading claims over the 1800m turf course and same distance as his victories in the Singspiel, Al Rashidiya and aforementioned Jebel Hatta. He is three for three this year since being gelded. His trainer, Saeed bin Suroor, won the Dubai Turf with Benbatl last year, who like Dream Castle was victorious in both the Singspiel and Al Rashidiya, but only second in the Jebel Hatta. I Can Fly – “I Can Fly is well and did what we hoped she would at Dundalk a few weeks ago. She’s very straightforward but also has plenty of class and we are looking forward to her running,” trainer Aidan O’Brien said. Lord Glitters – It was a familiar routine for the grey as he appeared on Meydan’s turf track at 7:00 a.m.
Southern Legend – Mere moments after superstar filly Almond Eye scorched the Meydan grass on Wednesday morning, her rival in Saturday’s Dubai Turf, Southern Legend, shaped as a far less imposing figure when he ambled through an easy 1000m gallop. Not that trainer Caspar Fownes is worried, though; far from it. Jockey Zac Purton will arrive in Dubai after riding at Happy Valley on Wednesday night. Vivlos – Had her final breeze Wednesday morning over the Meydan turf course with regular work rider Shinji Yasuda. She initially warmed up with a one lap canter over the dirt track before moving over to the turf where she went 1000m in 67.3, finishing with a solid 12.3 final 200m. Cheval Grand – Cheval Grand had his final breeze Wednesday morning over the Meydan turf course with regular work rider Shohei Matsudate in preparation for Saturday’s Longines Dubai Sheema. He initially warmed up with a one lap canter over the dirt track before moving over to the turf. The large chestnut son of Heart’s Cry went 5 furlongs 68.4, with a sharp 12.2 final furlong under regular work rider Shohei Matsudate. Old Persian – The winner of Super Saturday’s Dubai City Of Gold Sponsored by Emirates SkyCargo had a breeze on the grass at trainer Charlie Appleby’s Marmoom stables this morning to complete his preparations for the weekend. William Buick’s mount will be bidding to provide Godolphin with their third straight win in the race following on from Hawkbill and Jack Hobbs, and the 4-year-old boasts great form having beaten subsequent Melbourne Cup winner Cross Counter at York last August. “He has had his prep run and we haven’t needed to do a lot with him at home,” Appleby said. “He worked on the grass last Saturday and was on the turf again this morning. Racing History – Saeed bin Suroor saddles Godolphin’s Racing History, second in the Dubai City Of Gold on Super Saturday over the 2410m on turf. Drafted – Drafted, trained by Doug Watson for Misty Hollow Farm, drew post 5 in a stellar field of ten assembled for the Dubai Golden Shaheen sponsored by Gulf News. The 5-year-old son of Field Commission cantered 2000m on Wednesday morning at Red Stables. Drafted sports an all-or-nothing type record with six wins and one second from 12 starts. When on his game, and he often is at Meydan where he has recorded five victories including a last-out score in the Group 3 Mahab Al Shimaal, Drafted can be untouchable. Pat Dobbs will be in the irons on Saturday and Watson said he expects the rider to make one run. Imperial Hint – Trainer Luis Carvajal Jr. continues to be very happy with how Raymond Mamone’s Imperial Hint has been training towards the Dubai Golden Shaheen, two years after having to miss the race after the horse got sick upon arrival in Dubai. Imperial Hint will be lining up against some familiar foes Saturday with XY Jet and Roy H, who finished second and third, respectively, last year. Promises Fulfilled – Emerged shortly after 7:00 a.m. under exercise rider Heather Smullen and galloped over the Meydan dirt track two days after putting in his final serious work in advance of the Golden Shaheen. “He was moving well and came back sharp,” Smullen said. Trained by Dale Romans and owned by Robert Baron, Promises Fulfilled has thrived since cutting back to sprint distances following an off-the-board effort in the 2018 Kentucky Derby (G1). The chestnut colt won three of his last four starts of his sophomore campaign, including a victory in the H. Allen Jerkens Stakes (G1) at Saratoga last August 25. When he won the Phoenix Stakes (G2) at Keeneland in October, he became the only member of last year’s 3-year-old male dirt division to defeat older horses in a graded stakes. Roy H – After jogging around the oval yesterday morning Rockingham Ranch and David Bernsen’s runner did not make an appearance trackside on Wednesday morning and instead he remained in the barn area under the watchful eye of Peter Miller, along with the trainer’s other three charges entered on the Saturday night card. Roy H, the defending back-to-back (2017-2018) Breeders’ Cup Sprint winner finished third in this race last year and is well familiar with the drill here. “The good news is they have been here before so they are keen on that experience already. There will be no changes with equipment or schooling or anything else. Even though we didn’t win last year we were right in the swing of things, so hopefully, we can be right there this year and then pull it off,” Trump said. Rockingham Ranch’s principal is Southern California commercial and residential real estate developer Gary Hartunian and the stable is also the majority owner of fellow Dubai Golden Shaheen competitor X Y Jet, the runner-up last year. Rockingham Ranch in addition owns 2017-2018 Breeders’ Cup Turf Sprint winner Stormy Liberal, who returns to the Al Quoz Sprint for Miller after a tough beat second place finish in 2018. With that powerful line-up Saturday it seems as though Rockingham Ranch has a big target on its back this year in both races. “It’s an away game for us so for us it doesn’t feel that way. The bottom line is that you have to show up and as long as they’re prepared that’s the best we can ask,” said Trump. Tato Key – Twelve time winner Tato Key continued to warm up for his biggest assignment to date by cantering just over a lap of the Meydan dirt track on Wednesday morning. The David Marnane-trained 4-year-old arrived shortly after 7.00 a.m. and continues to please his trainer while in Meydan. Tato Key was second in the Al Shindagha Sprint in January behind Drafted before going down to the same rival again when finishing third in the Mahab Al Shimaal last month. “I think the three week lead into this race will be perfect for him as he had five weeks between his first run and second run out here and that was maybe slightly long,” Marnane continued. X Y Jet – The blistering fast X Y Jet continues to look well during track work at Meydan in advance of his third appearance in the Dubai Golden Shaheen sponsored by Gulf News. Trained by Jorge Navarro for owners Rockingham Ranch and Gelfenstein Farm, X Y Jet finished second here, by a neck, in 2016 when collared by Muarrab. The 7-year-old Kantharos gelding, who was troubled with knee issues and raced sparingly, returned last year with another prominent effort only to be nabbed at the line by the rallying Mind Your Biscuits. X Y Jet took to the Meydan dirt at 7:00 a.m. on Wednesday under exercise rider Anthony Cruz with both Navarro and owner Brian Trump of Rockingham Ranch in attendance. The speedy grey missed days of training ahead of last year’s Dubai Golden Shaheen but has proven to be a fixture on the Meydan dirt this week with some efficient strides. Rockingham Ranch is also represented on Saturday’s lucrative Dubai World Cup card with the returning Roy H (3rd, 2018 Dubai Golden Shaheen) and Stormy Liberal (2nd, 2018 Al Quoz Sprint). Trump was full of praise for Navarro’s horsemanship in keeping X Y Jet in good order ahead of Saturday night’s test. “There’s always a concern when you have a horse that’s had three knee surgeries, but Jorge Navarro has done a tremendous job with this horse,” Trump said. “X Y Jet is a gritty horse. He’s been nosed out here twice now and we’re hoping that the third time’s a charm for him. He’s a very special horse to us all. “With sprinting, in general, there’s not many spots. We look every year at the Dubai Golden Shaheen and the Breeders’ Cup Sprint as our two bookends for the year. We plan our races for the year around these two races. Divine Image – The Al Bastakiya Sponsored by emirates.com winner had an outing on the grass at trainer Charlie Appleby’s Marmoom stables on Wednesday morning to complete her preparations.The filly has matured with each of her three runs at Meydan this year and looked much more the finished article when breaking smartly to win by a wide margin on Super Saturday. Gray Magician – The son of Graydar, whose maternal grandsire Johannesburg won the 2001 Breeders’ Cup Juvenile, was a bargain $18,000 purchase as a yearling for owners Wachtel Stable, Eclipse Thoroughbred Partners and Gary Barber. He’s earned $84,140 with one maiden special weight victory in seven starts but is still looking for his first stakes score as he steps up into international Group 2 company. After being sent out onto the track Tuesday morning under Paco Lopez for a final blow-out of three furlongs, Gray Magician did not make a trackside appearance today. He remained in the stable area, where he was walked along with Miller's other three Saturday entrants. Gray Magician will break from gate 8 under Joel Rosario. “That’s a good draw for him in the middle of the field. He’s tactical so I’d like to see him get a position, and then hopefully, we’re good enough,” Miller said. Jahbath – William Haggas will be on the ground in Dubai on Thursday and has left preparation of His Highness Sheikh Hamdan bin Rashid Al Maktoum’s colt to his staff. He made another appearance on the dirt track under regular partner Simon Scott, with big-race jockey Jim Crowley expected to have a feel of his mount tomorrow. “He’s very well and the boys are happy with him. 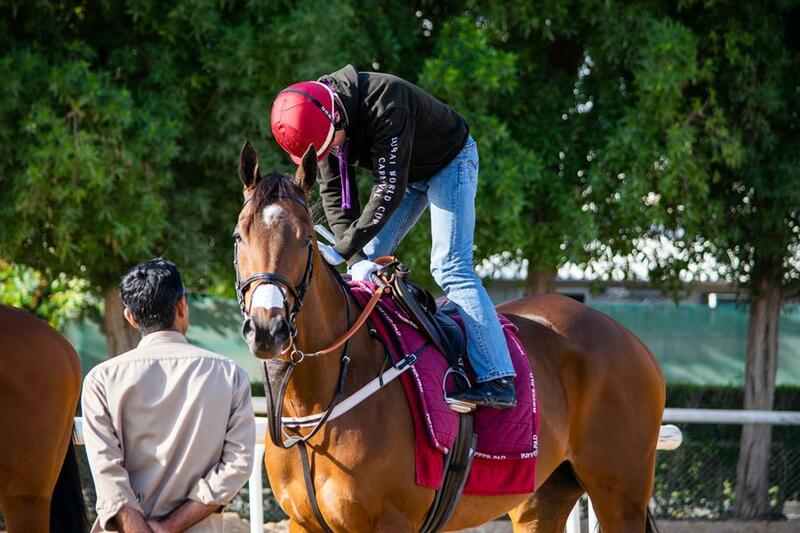 He cantered today with a stretch planned for Thursday,” Haggas said. Plus Que Parfait – Trainer Brendan Walsh, who arrived in Dubai Tuesday afternoon, likes what he sees from his charge. Plus Que Parfait, which means more than perfect in French, gets the services of top rider Jose Ortiz. Walking Thunder – Three runners from Ahmad bin Harmash’s local desert stable are enabling their owners, the Phoenix Ladies Syndicate, to enjoy a remarkable first season. The UAE Derby trio of Walking Thunder, Golden Jaguar and Superior have contributed six wins between them, all under stable jockey Connor Beasley. Given the pick of the rides on Saturday, Beasley has chosen Superior, a first-time-out winner who has improved with each of his three runs. Belvoir Bay And Stormy Liberal – The Peter Miller stablemates, part of the trainer’s four-horse contingent for Saturday night’s card, followed up their Tuesday morning final blow outs with a quiet day back at the barn on Wednesday ahead of Saturday’s $2 million Al Quoz Sprint (G1) sponsored by Azizi Developments. Stormy Liberal is owned by Rockingham Ranch and David Bernsen LLC and racing manager Brian Trump said that Miller had all four horses simply walk in the stable area. Trump reported that the 2017-2018 Breeders’ Cup Turf Sprint winner and 2018 Male Turf Horse champion, who was a runner-up in last year’s edition of the Al Quoz Sprint, is primed for this race. “Stormy Liberal is excellent. It’s frustrating because his two prep races (in California) for this didn’t go the way we were hoping. In the first race he got beat by Caribou Club (also in the 2019 Al Quoz field) in a Grade 3 race, and quite frankly, I don’t think he was cranked up yet. We probably needed to get a few more works in him. In his second race, the allowance race, he slipped and the rider said it was a pretty substantial slip and he almost went down. Luckily, he was safe. We wouldn’t have put him in this position to move forward here if he wasn’t 100 per cent. He traveled here very well. He’s looked great out on the track. He’s ready to go now. The key with him is he always seems to peak at the right time. We expect a big race out of him,” Trump said. Belvoir Bay, a 6-year-old mare, comes in to the biggest test of her career undefeated in 2019. The multiple graded stakes winner won the Wishing Well by 4 ¾ lengths on Feb. 16 and the Las Cienegas by 1 ¼ lengths on Jan. 12, both at Santa Anita. Miller’s other two Dubai World Cup Card runners are Rockingham Ranch's Roy H in the Dubai Golden Shaheen and Gray Magician in the UAE Derby. Blue Point – A further two spins around Charlie Appleby’s Marmoom stables’s dirt track await the main contender for the Al Quoz Sprint sponsored by Azizi Developments after the 5-year-old breezed on the grass there this morning. After being withdrawn at the start 12 months ago, connections have given him an extra outing in the build-up to the race to allow him to be even better prepared, and his trainer described his key assets. Caribou Club – At the age of five, Caribou Club is showcasing arguably the best form of his career as evidenced by his victory over champion Stormy Liberal in the Joe Hernandez Stakes (G3) at Santa Anita Park. Given his family’s history, owner/breeder Glen Hill Farm is not surprised the gelded son of City Zip is turning out to be worth the wait. Though his resume isn’t as glamorous as some, Caribou Club is following a longstanding trend amongst his kin of getting better with age. His dam Broken Dreams – herself a Glen Hill homebred – didn’t debut until age four and waited until the following season to earn her first graded stakes victory. Caribou Club earned his first graded stakes victory last June when he took the Connaught Cup Stakes (G2) at Woodbine and ended his 2018 campaign with a win in the Seabiscuit Handicap (G2) at Del Mar. Lost Treasure – As scheduled, the quintet of runners on the night from Aidan O’Brien remained in the confines of the stabling block with a first appearance on the dirt track set for Thursday morning, as has been standard practice at this meeting down the years. “They are all well, they all travelled 100 per cent,” said Pat Keating, Ballydoyle’s vastly experienced travelling head lad. Sands Of Mali – Sean Davis was aboard the Group 1 British Champions Sprint winner as they went around the grass track at 5:00 a.m.
Viddora – Australian mare Viddora took it easy on Wednesday morning with the Al Quoz Sprint (G1) contender having been put through her paces in a searching breeze a day earlier. Trainer Lloyd Kennewell reported that all was well with the 6-year-old as she remained in the quarantine barns on Wednesday. Coal Front – Coal Front was among the first horses to hit the Meydan dirt track, coming out at 5 :00 a.m. and putting in his typical strong gallop under exercise rider Amelia Green. The fact that the son of Stay Thirsty is still in training, much less a leading contender for international accolades, is itself an impressive feat. After winning the Gallant Bob Stakes (G3) in September of 2017, Coal Front went to the sidelines and didn’t return until the following November when he was fifth in the Bold Ruler Handicap (G3). Since that run, however, Coal Front has not only picked up where he left off form wise, but improved upon his raw ability. After winning the Mr. Prospector Stakes (G3) in December, he stretched out to two turns and captured the Razorback Handicap (G3) by a neck in his seasonal bow on February 18. Good Curry – The Bayram Kocakaya trained Good Curry, who has already run twice at Meydan, was continuing his preparation for his bid in the Godolphin Mile on the dirt track at Meydan on Wednesday morning. Muntazah/Kimbear – Muntazah arrives at the Godolphin Mile in career form with a pair of eye-opening Group 3 wins on the Meydan dirt. The 6-year-old Dubawi gelding opened his 2019 account by capturing the Firebreak with a decisive win. The talented bay then confirmed his form with a facile 10-length romp in the Burj Nahaar. Muntazah, to be piloted by Jim Crowley, drew post 6. “I like the draw for Muntazah. He should have no problems from there,” Watson said. Watson will also saddle Kimbear in the Godolphin Mile. The 5-year-old Temple City horse finished sixth in this event last year. Both Muntazah and Kimbear cantered 2000m on Wednesday at Red Stables. The experienced conditioner said Kimbear is recovering well from recent foot issues and has trained forwardly into Saturday’s event. “Kimbear has come out of his recent work well. You always worry about that foot after a work, but he came out of it very well,” Watson said. Cross Counter – The Charlie Appleby-trained 4-year-old and Emirates Melbourne Cup winner is set for Saturday night after a spin around the turf track at Goldolphin’s private training facility at Marmoom this morning. Cross Counter is one of the more lightly-raced runners in the race and will be having just his second start over 3200 metres. “He is a horse who we saw progress last year,” Appleby said. “Going in to the Melbourne Cup he broke the track record at Goodwood, was beaten by a horse who we like in Old Persian in the Great Voltigeur and then headed down to Australia and did what he did in the Melbourne Cup. Gold Mount – Trainer Richard Gibson arrived in Dubai on Wednesday morning and rushed straight to Meydan to inspect his two horses, headlined by Dubai Gold Cup (G2) runner Gold Mount. Gibson is undertaking an audacious assignment with Gold Mount, stepping him up to 3200m for the first time, and he admits that it is a difficult task to give him the necessary grounding for the marathon journey in Hong Kong. Gold Mount is Hong Kong’s first runner in the Dubai Gold Cup and only the third Sha Tin-based horse to run over the 3200m trip in the last 15 years. Prince Of Arran – Continued his usual routine of cantering around Meydan just after 7:00 a.m. with Natasha Eaton aboard. Al Shamoos – French handler Charles Gourdain arrived in Dubai on Wednesday and came straight to the track to see his mare go for a light canter once around the dirt track. He seemed pleased with what he saw and he confirmed: “The filly is fine. I came this morning to see her work and I was happy to see that she moved well on that track. Changing surface always comes with a question mark.